MTV are filming tonight’s show and someone has the idea that I should make a T-shirt for the occasion. 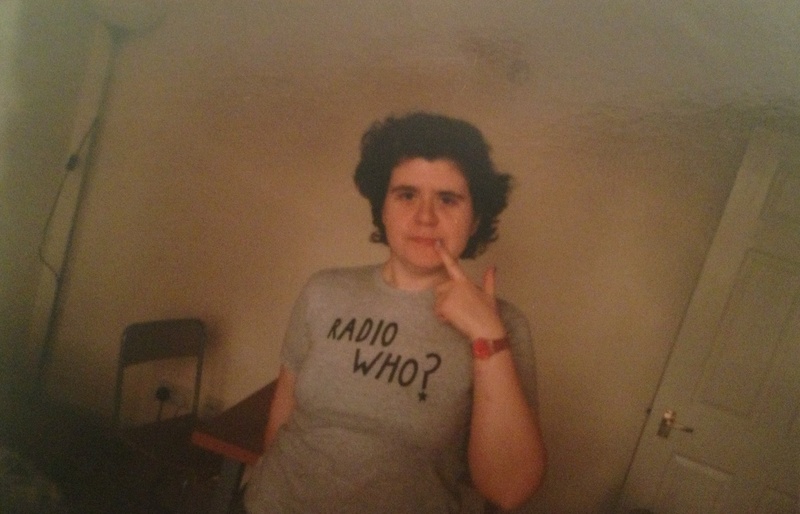 Clarabelle takes a marker pen to a plain grey shirt and soon my chest bares the legend “Radiowho?” It’s an in-joke for us as members of the band’s Message Board where mentioning said band often sparks cries of derision from the regulars. We travel into central London to meet more of the regulars and find something to eat. Trying to please everyone, we end up in a pub near the embankment with some sort of vegetarian Greek platter of humus, olives and pitta bread. There is something dodgy about the olives but we wash them down with a beer. The group makes its way to Shepherds Bush again, intent on a good time. But by the time we arrive at the Empire, Clara and I both have to make a beeline for the toilets in the adjacent pub, there really was something dodgy about those olives. All thoughts of joining the queue are sacrificed to dealing with our health crisis. The worst is past by the time the doors open, but we are so late and I am so keen to get inside, that I neglect to check the ticket desk. I have a bought ticket for tonight and have not seen Tim again, Keiko and friends are already inside. I am still not feeling well. The gig is being filmed and the cameras, one on a large boom across the middle of the crowd, are distracting. I can hardly seen anything from where I’m standing and I feel angry and ill. I’m not really enjoying myself anymore, maybe this is a gig too many. I don’t remember any more than vague impressions of this gig. The MTV videos, which I got to see sometime later, and which are now on You Tube, don’t help fill in the gaps. The filming style anticipates the band’s own later use of CCTV, the gig had minimal lighting and despite the large cameras and booms at the show, most of it is shot in grainy close ups of hands and instruments. This was not the experience of an audience member, footage is shot from behind the band on the stage, perhaps trying to be immersive but failing to capture what it was like to be there. The MTV special doesn’t cover the whole show, just a few songs interspersed with interviews. Thom appears on his own, he is the opaque, emotional centre of the band; Jonny and Colin are interviewed together – Jonny is musically analytical, Colin talks as if he’s the band’s biggest fan. Ed and Phil form the last group. Ed the band’s politician, presenting his version of what the new material means and Philip polite and diplomatic as always. I find myself identifying the most with Thom’s version, even if it’s not the most factual; he likes to mess with people’s expectation and even says in the clip that he likes to put things in the wrong place. That interview must have taken place before the gig, and I didn’t see it until weeks later, but he seems to understand why we’re here. My notes are all about what happened afterwards. As I failed to check with the box office before the show, I have no pass. I go back once the show has finished but of course by now there is no one there and the list is long gone. I am ejected from the venue. I go round the block looking for anyone I know. Big Colin is too busy minding the door. I find a step at the bottom of a fire escape and sit down to wallow in my own stupidity. This was not how I wanted to end up, I’m cold and ill and fed up. A while later, Hilda, the tour manager, who I have not seen a lot of at these shows, finds me. I have a card for Thom and I try to give it to her. I tell her I’m looking for Keiko, she will still be here somewhere unless the band are gone. Hilda drags me inside and up a lot of stairs. I pull myself together and try to act normal. I had cracked up a little while I was outside, it wasn’t a good gig for me, it’s the last night of the tour. I’m angry at myself and other people and things I can do nothing about. We reach the upstairs bar and people are already leaving, but Thom is still there, signing Keiko and Yasuko’s posters. I arrive complaining about the cold and realise in that moment that I would have been on the list tonight, if only I hadn’t been puking before the show, why did I doubt it? Thom pulls a face at me. They’ve been here for a while and he’s a bit drunk. “Have you recovered?” I ask, meaning from the show. “Is there any drink?” I’m parched. “No I’ve drunk it all. All of it.” He’s not joking.